Cannabis oil extract has been used medicinally for generations to help treat a variety of conditions, and its popularity has increased considerably in recent years. Of the various extraction methods used, ethanol extraction is increasingly becoming the method of choice because of its ability to economically and effectively produce an extract with a high terpene content that is safe for consumption. In the video interview, Jim Bilotta of California Gold describes the protocols required to batch concentrate winterised cannabis extract in ethanol using both a rotary evaporator and a Genevac Rocket Synergy evaporator. Mr Bilotta confirms the considerable walkaway automation benefits of the Rocket Synergy evaporator both in terms of freeing staff to do other tasks and reproducibly producing a top quality cannabis oil extract. 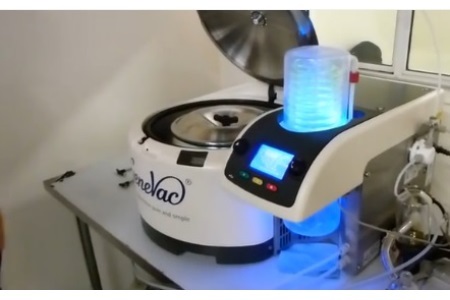 Genevac Rocket and Rocket 4D Synergy evaporators set a new benchmark in evaporation versatility. Fitted with a stainless steel evaporation vessel either system can dry or concentrate batch volumes of up to 5L with no user intervention or attention. An auto-feed system on the Rocket 4D synergy extends capacity, enabling unattended automated processing of many tens of litres of product. For further operational versatility the bowl rotor may be quickly removed and replaced with a six position flask rotor to accommodate the full range of Rocket Sample handling solutions such as flasks, tubes and SampleGenie. Five times faster than other 'intelligent' evaporators, the Rocket Synergy evaporator is capable of replacing several rotary evaporators, from benchtop to 50- litres capacity, saving valuable bench space and improving your productivity. Genevac, now part of SP Scientific, was founded in 1990. Today the company employs around 65 people, with manufacturing, R&D and marketing headquartered in Ipswich, UK. Genevac offers a comprehensive portfolio of evaporators to suit almost any solvent removal application, purchasing budget or productivity requirement.